Like many others before and after me, as a student of architecture I was fascinated by Le Corbusier's definition of a house -"machine for living in." Nothing else could better define a new way of living, modern, efficient, into the future. However if you think about IT, in reality there Is nothing much of a machine in the houses we live in until recently and only if we begin to consider the improvements in sophisticated environment control HVAC, entertainment and communications system. No, many years later I realized instead, that the definition was better applied to a boat. I'd rather take Corbusier's concept with a twist: machine for living in. the ocean. Consider this: except for the space station now in construction in the outer space, what other machine do we live in? For the moment let's not consider the comfort factor which I'm sure is not the space station forte. You can consider cars, airplanes, trailers and similar but in those machines you are not really living in, more like surviving in. And then there's the ocean, the last free territory on earth. What a concept, beautiful machines where we can comfortably live in and roam freely through the oceans. wonderful, but once you get to your destination preferably very fast and in safety, you want to be in contact with Nature, not in an enclosed machine. We can imagine the joy of the first use of a port light, the combination of a hull opening with a glass. 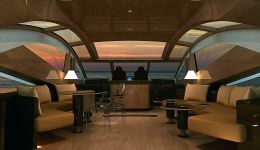 That same joy has evolved throughout the centuries and we can safely say that the use of glass has created a large impact in the design of modern yachts, and it's here to stay. One can argue that the use of glass in yacht design is not a fashion or just a temporary trend, exactly because it brings the outside in and vice-versa. In a similar way to what happened with architecture, since Mies Van der Rohe created the first all glass building in 1920, only possible due to advances in flat glass technology of the time, we see today's yachts using more glass, mostly due to advances in curved glass technology. For instance, we cannot talk about the use of glass in yacht design without mentioning the 240-footer originally named Eco, launched in 1991 by Blohm & Voss with its innovative use of convex glass. 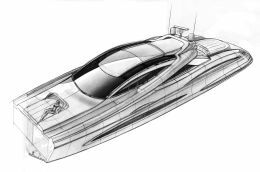 Just for the fun of it we can loosely trace an interesting parallel between the evolution of how glass is used in the design of buildings with the development of some recent yacht launches. In architecture glass was first used to achieve transparency and later glass was also used as cladding material covering solid parts of the building. 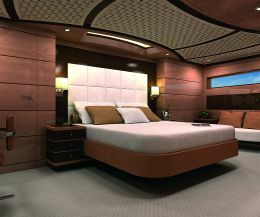 In yacht design the evolution follows a similar pattern with a gap of a few decades. More recently, just to name a few, designs like the Wally Power and others bring to mind Mies's Farnsworth house of 1946 or Philip Johnson's glass house of 1949, which can be considered as the same all around glass concept adapted as a superstructure to go through the water. Moreover, we can say that Rising Sun, 453-footer built by Lurssen in 2005, with the upper decks completely covered with glass is the nautical version of many modern skyscrapers. 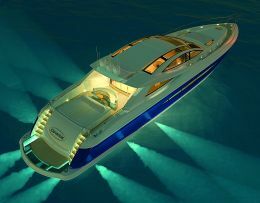 And the specialized magazines are populated with many design concepts, mainly mega yachts, confirming the trend. Each good design is good based on its own merits but they all share the use of glass as predominant material in its concept. In other words, glass is used with ever more frequency and today it's accepted as a normal material by owners and by yards alike, without prejudice of function. And we are not talking about using glass just for exteriors. Nowadays it's normal to see doors, wall, floors, light fixtures, furniture, stairs, ceilings, almost everything, in glass. It's used to bring light and views and to create changing moods, combined with new lighting systems and colored glass. Of course all this is possible due to the variety of glass products and types on the market that can offer privacy, safety and security. Using coated glass we can achieve solar and thermal control, with LCD glasses we can have transparent and opaque walls, with double glazing we can achieve efficient noise control, making it an extreme flexible, useful and beautiful material. When Rome based Canados shipyard asked me to design its new 90' Open they were looking for a younger, trendier, fresh look. I had already tried some ideas on how to use glass on boats and wanted to expand on that experience. The Superyacht 200 is the first attempt to have a totally enclosed fly bridge using a sliding glass roof which could be partially open. Another interesting example is the 120' Power Catamaran that I designed in 1996 featured a glass enclosed fly bridge dome that could be open by rotating the aft half under the fore half. This, combined with the opening of the aft doors could transform an entirely enclosed area in an almost completely open area to be enjoyed equally on cold or rainy or perfect days. From the first sketches one of the main concerns with the Canados project was to propose a new use for the Open concept through the use of glass without going exotic or designing something not feasible on a production environment. Another main concern was of course to design a very elegant, balanced and beautiful boat, to appeal to a sophisticated and demanding clientele. I believe the designer shall have the capacity to interpret as much as to inspire. Plus, in order to complete the 90' Open package, speed was part of the equation from the beginning and the yard developed a new hull that combined with Arneson surface drives can take the boat to 45 knots, which can be translated as fast in any language. When I decided to make part of the roof in glass I had in mind one of the universal principles of design which asserts that there's nothing better than a straight line to make a curve line stand out and vice-versa. We can easily understand why: many straight lines together or many curved lines together will compete for attention and the result is an interference effect. No, we wanted a very clear definition of the overall black and white exterior graphics interaction, black being the glass and white the fiberglass. The glass used in the roof, main salon aft door and side windows is LCD type, which can be fogged individually to control light and transparency, avoiding any undesired excess of sun light and guarantying privacy on the eventual marina side by side mooring. Since the windows can be fogged, any other window treatment such as curtains or black outs are completely eliminated, they become obsolete. The windshield, of course, is clear glass at all times. For the interior we wanted to carry on with the concept of transparency and abundance of light so we decided for a furniture design that also incorporates glass in the tables. To avoid accidents, all tables are framed in wood. The sofas, the beds and night stands are floating above the floor, adding to the idea of weightlessness. Underneath the sofas, custom light fixtures recessed in the floor accentuate the anti-gravity effect. Since you can get very quickly to your destination with Canados 90' Open, once you're there you'll probably want to enjoy the skies, the water, the views. For the sky views we already provided the sunroof and the fixed windows in the roof sides. But what about down below? To resolve that we created a very long and narrow port light along the hull placed at the eye level which from the inside provides very wide views of the horizon, enhancing the openness effect. So now that we have views to the sky and to the horizon, why not have views of the water? The swim platform is the perfect area to provide views of the water and of the Arneson drives so you can appreciate the mechanics of your boat. Carefully, we studied the placement of openings aligned with the propellers and installed underwater lights for night viewing. This glass is of a special type with anti skid treatment in its surface, for obvious reasons. 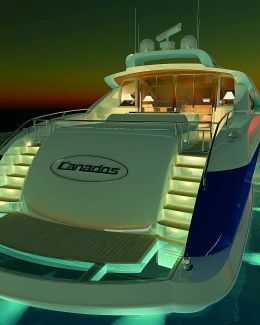 What would be the night effect of so much glass was so intriguing to me that we decided to make renderings showing the boat at night. It's easy to imagine the boat during the day but at night the boat should look like a giant lamp glowing from the inside out and that's what we tried to capture. To complete the transparency touch we also created a sky light for the owner's stateroom which is under the salon. This way, the main salon floor also has a bit of glass that can be fogged as well, providing privacy and fun for the owners and guests. Still in the main salon we decided for the use of the Louis Ghost chair and Bourgie lamp by Kartell, both made of clear Plexiglas. Going down to the guest's area the stairway also is built with the raisers in glass with indirect light behind creating the effect of floating threads, similar to the sofas. Glass as we know it is not a new material. New are the technologies and the recent types of specialized glass that are now on the market and we can certainly expect more novel things to come. Fragile but strong at the same time, opaque and transparent, material of contradictions but incredibly versatile, useful and beautiful, definitely glass is here to stay. In fact, it's very likely to gain influence and find new uses in yacht design, improving the lifestyle quality of the machines we love to live in. Pretty much like the Canados 90" Open, by the way.